As mentioned in the article below the Society was formed in 1956 and we were proud to be celebrating our 60th Anniversary in 2016. The image on the left is the original badge from 1956 while the image on the right was the badge until 2016. We have connections and friendships with orchid societies up and down the country, not just in the MIdlands, and mount displays at many of their shows as they join us with displays at our own shows. We are a member of The British Orchid Council and are affiliated to the Royal Horticultural Society and to The Orchid Society of Great Britain. You can read more about our meetings and shows here. John is a Life Member now living in Australia whose father, Doug, was a founder member of the Society and in whose honour one of our trophies is named. 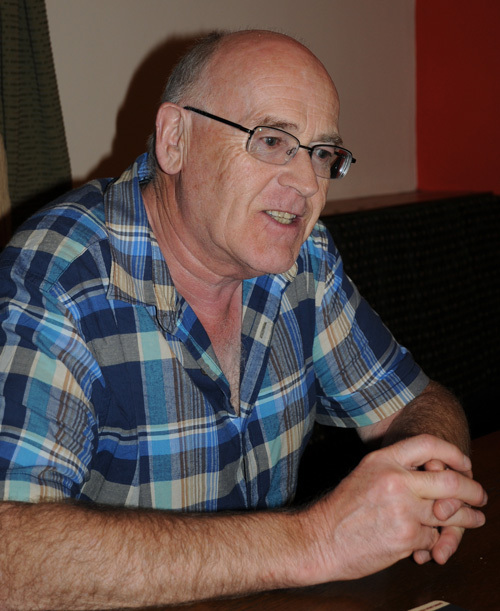 I have been asked to write about my earliest memories of the society, as there are probably few around now who remember what it was like more than fifty years ago. I have spent some time rummaging through my files and records for information, although of course I had to throw out a lot when I emigrated to Australia in 1992. The society was formed in 1956, at which time it was known as the Midland Section of the Amateur Orchid Growers Society (later to become the Orchid Society of Great Britain). Its first Annual General Meeting and Show were held at Compton Grange on 30th March, 1957 (see programme below). By the time the fifth annual show was held, in March, 1961, the society had become independent under the name of the Central Orchid Society. My father, Doug, and I visited our first orchid show at the Percy Thomas Hall, Y.M.C.A., Stafford Street, Wolverhampton in March, 1960, and decided at once that we wanted to grow orchids. Our enquiry about joining the society was referred to the secretary at that time, Irene Preece, and we soon became members, purchasing our first orchids from Wyld Court Orchids and Mansell and Hatcher. In those early days, we had a great deal of help and advice from Arthur Lacey, then chairman of the society. He gave us plants, and taught me the difficult technique of potting orchids with osmunda fibre and sphagnum moss in clay pots. From 1961, the annual shows were held at the College Hall of the Wolverhampton and Staffordshire College of Technology, Wulfruna Street, and in those days we had five or six trade exhibitors. Some of them sent their plants by rail, skilfully packed in large, hessian-covered crates. Stuart Low (Benenden) Ltd. of Crowborough sent their fine cattleyas by this method, and Charlesworth and Company Ltd. of Haywards Heath their famous odontoglossums and odontiodas. The companies’ representatives also travelled by train, and used to stay with members. I can remember on one occasion that Ken Norris of Charlesworth’s ragged Bert Johns of Stuart Low’s unmercifully when he found out that Bert had forgotten to bring his pyjamas, only to admit later that he had done exactly the same thing! The City of Liverpool Parks Department (orchid grower Mr. Potts!) also put on some splendid displays at our shows. In those early days, the prices of plants were quoted in guineas, although they were never marked on the plants as they are today. Negotiations between the nurserymen and their prospective customers were conducted very secretively, with the aid of a small black notebook. This was frequently the cause of embarrassment to novice growers, who had no idea of the relative values of the various plants. It was Peter Hines of Neville Orchids Ltd. who first shocked the orchid establishment by clearly displaying the prices of the plants on his stand. In 1968, when the College Hall was no longer available to us, the shows became much smaller affairs at Compton Grange, where monthly meetings were also held. The intention was to have just two trade exhibitors, but in the first year at this venue four turned up, resulting in a very cramped and crowded show. One of the earliest letters that I wrote as Honorary Secretary was to the members of the trade, making it clear that we only had room for two, whom we would invite. Our 1992 autumn show was held at the Perton Community Centre, which was a much more spacious venue and became the Society’s home for both shows and monthly meetings. 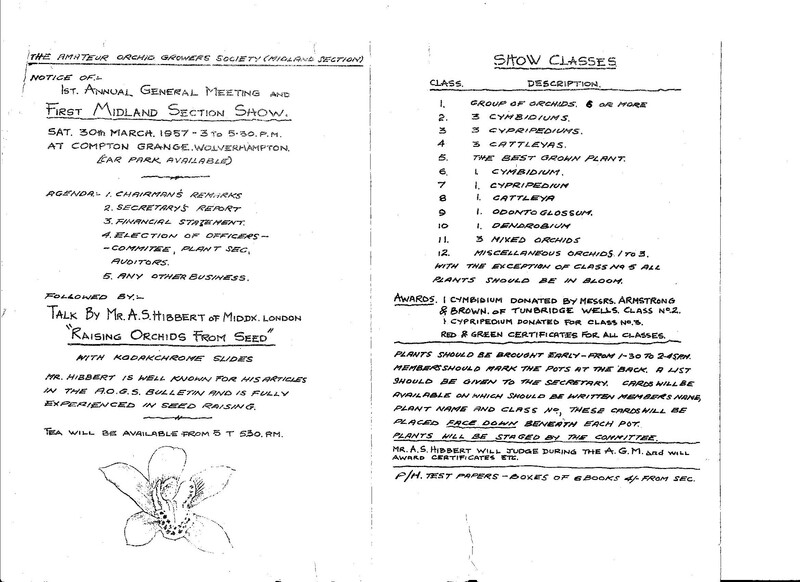 In the early 1960s, a group of our members decided that meetings should be held in Birmingham, and the Birmingham and Midland Orchid Society was born. A few years later, members of that society formed the Solihull and District Orchid Society. Although relations between the local societies were somewhat strained in the early days, over time a much more cordial atmosphere developed, even to the extent of putting on displays at each others’ shows, and members joining more than one of the societies. During our 1971 annual show at Compton Grange, a discussion took place which was to lead to the formation of the British Orchid Council as explained in another article. I have already mentioned Arthur Lacey and Irene Preece and I thought I should also include a few of the other ‘characters’ that I remember from the early days. Our President for quite a number of years was Mr E. Hickinbottom, who was the only member that I can recall employing a professional orchid grower. Harold Lakin was an ‘elder statesman’, who was a Vice-President when I first knew him, and often called upon to judge and comment on plants on display at our meetings. In our September, 1962 newsletter, an article was reprinted that he had written for ‘The Orchid World’ in 1916, so he had clearly been growing orchids for a long time! I never knew Thomas Bertie Wolverson, who died in February, 1961, but I did attend the auction of his collection in June of that year, and Dad and I bought plants to add to our fledgling collection. The auctioneer on that occasion was Sidney Albury, at the time the Vice-Chairman of the society, who later became Chairman. He was a keen grower of alpines as well as orchids, and had Fritillaria alburyana named after him. He used to go on plant hunting expeditions, and sadly died from pneumonia at the age of 44 whilst looking for alpines on the lower slopes of Annapurna. He was laid to rest high in the Himalayas amongst the plants he loved. I could go on reminiscing about old members for ages – Harold Jukes, a founder member and committee stalwart who did a spell as Chairman, Frank Yates, a long-serving and conscientious Treasurer, and Horace Price a retired coal miner who was a loyal supporter of the society. Over the years, Dad and I made many good friends through the society, sadly most of them, like him, no longer with us. We shared lots of enjoyable experiences and social events, and our lives were enriched in so many ways by our interest in orchids.